The Battle Of Thermopylae is the stuff of Western legend, though it was an actual historical event in 480 B.C. A tiny cadre of 300 Spartan soldiers fought the mighty armies of Xerxes, the Persian king in charge of a vast empire. This story has lit the Western imagination for centuries, and director Rudolph Maté crafted the battle into a rousing historical film full of political intrigue – and even some romance. 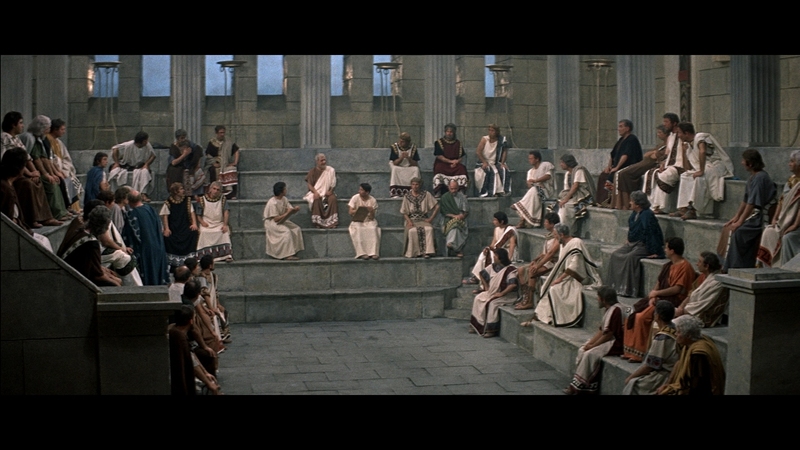 The 300 Spartans from 1962 is the indirect inspiration for the recent action blockbuster 300, which swipes many of its elements from the older film. 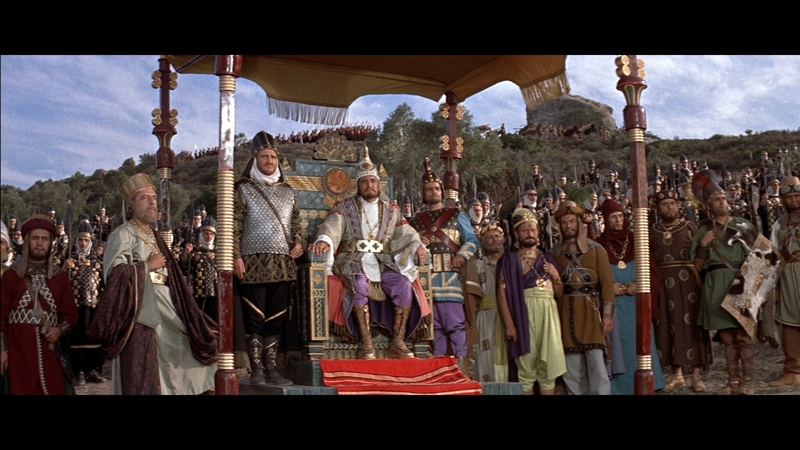 A big hit at the box office in 1962, the sword-and-sandal mini-epic holds up reasonably well. 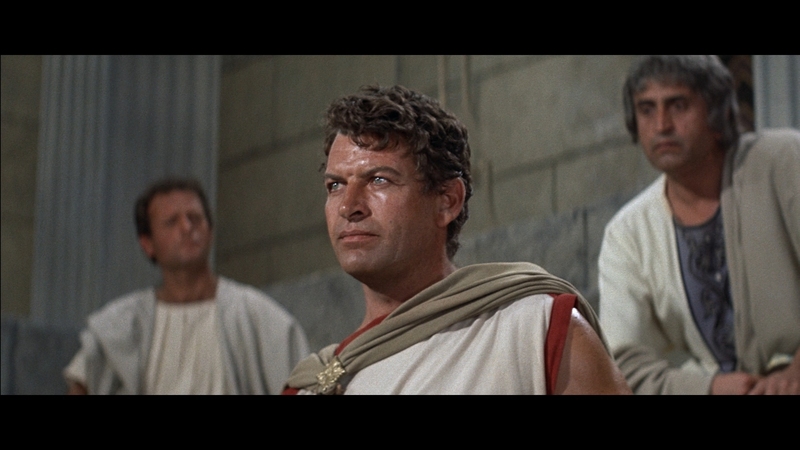 Richard Egan stars as the Spartan King Leonidas, a leader of men that eventually takes his personal bodyguard of 300 Spartan soldiers into a hopeless battle. It is the year 480 B.C. and Greece consists of independent city-states like Sparta and Athens. 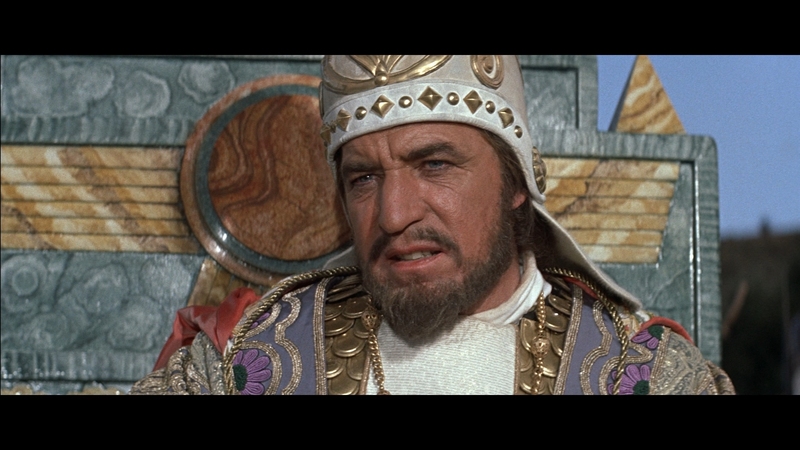 King Xerxes (David Farrar) controls Persia with his vast armies and looks to expand his empire to Greece. Athens pleads with the other Greek city-states to band together and repel the Persian invaders. Leonidas recognizes the wisdom in Athen’s plan and offers up the forces of Sparta, the most advanced military state of its time, to confront the Persian forces for Greece’s defense. 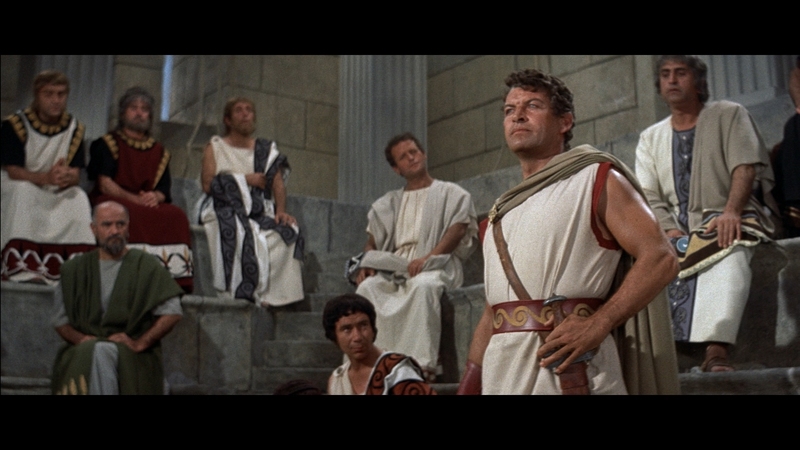 While Leonidas is Sparta’s king, he still must seek the approval of Sparta’s council to use their soldiers. Spartan culture was dedicated to training warriors and its soldiers were considered the finest in Greece. 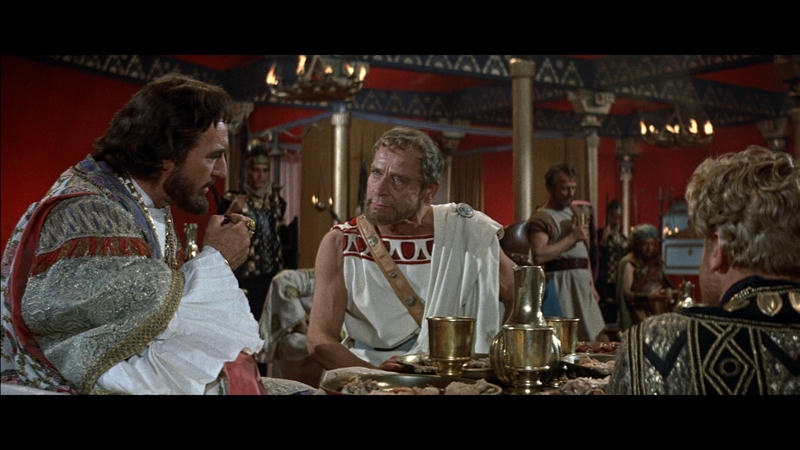 Through the political machinations of the Spartan leadership, they delay approval for Leonidas’ request until after a religious festival, when it will be too late to stop the Persians. Leonidas marches off with his personal contingent of 300 Spartan soldiers, aiming to battle the Persian forces until the remaining Spartan soldiers can arrive. 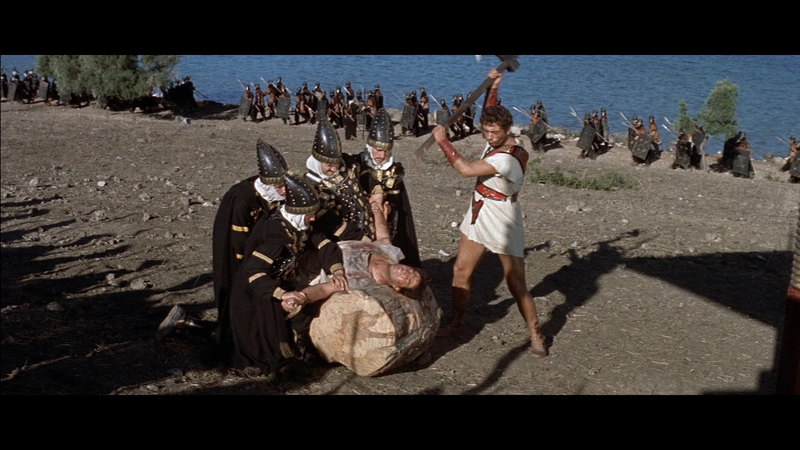 The 300 Spartans does not have quite the scope and grandeur of other famous sword-and-sandal epics from the period. The narrative is surprisingly intimate, confining its action and plot to a fairly limited amount of characters. Its first two acts are more concerned with internal Greek politics and a young Spartan soldier’s intention to marry Leonidas’ niece than pure action. 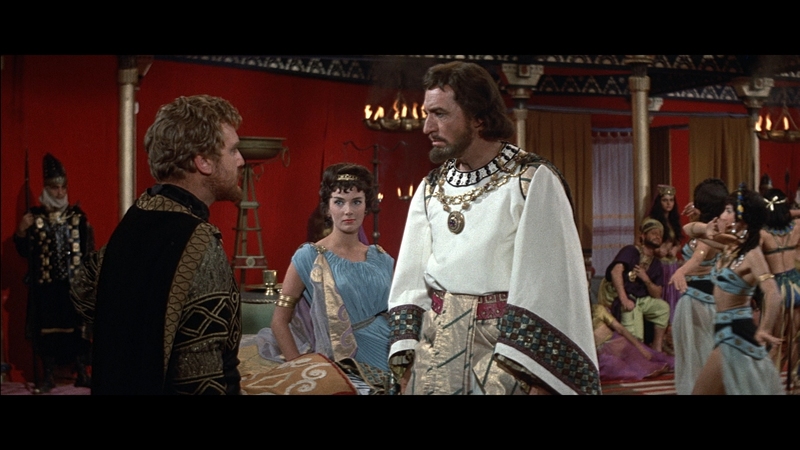 Phylon (Barry Coe) wants to marry Ellas (Diane Baker) but gets denied when it is found out that his father is in the enemy camp with King Xerxes. 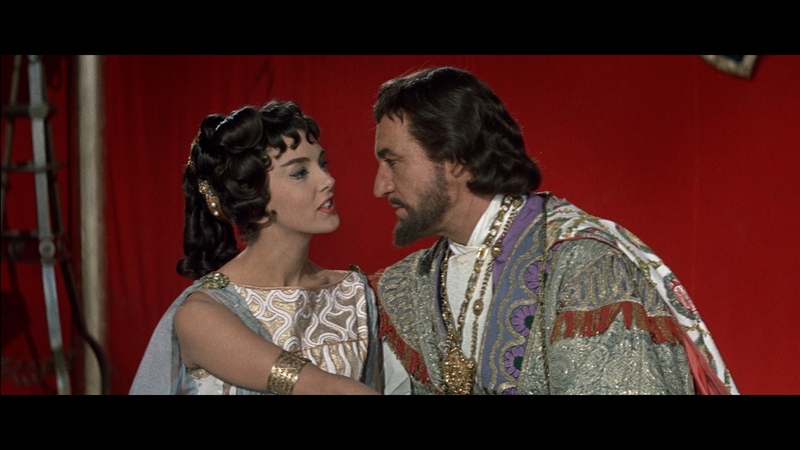 The young couple go on a foolish quest together to regain Phylon’s honor, almost killing Ellas in the process. 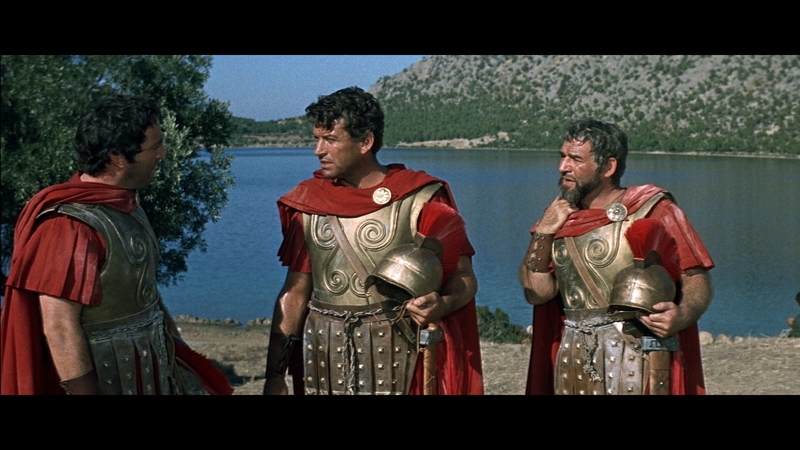 Shot on location in Greece with the cooperation of the Greek government, it is undeniable The 300 Spartans looks great and its production values exude authenticity. It was a big-budget Hollywood production made by studio veterans that knew what they were doing on film. 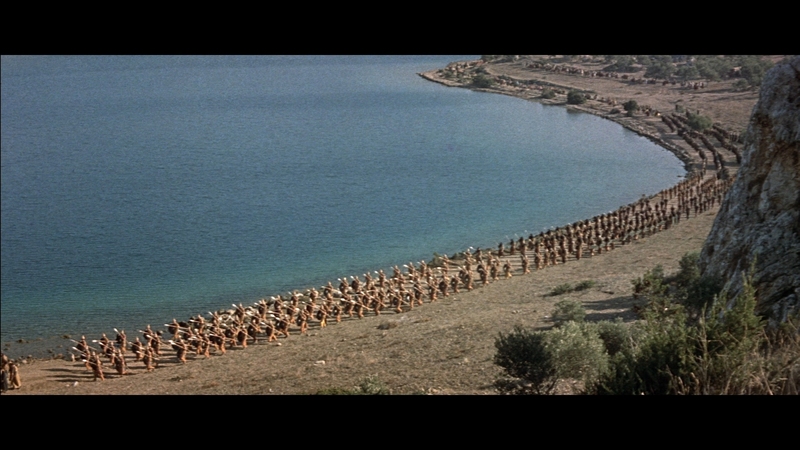 There is no use of CGI here, 300 actual men in Spartan war cloaks march on the screen in a realism that simply cannot be duplicated by the parade of greenscreen work in its modern-day equivalent, the movie 300. Saying that, the fight choreography in movies has improved by leaps and bounds since The 300 Spartans was originally released. 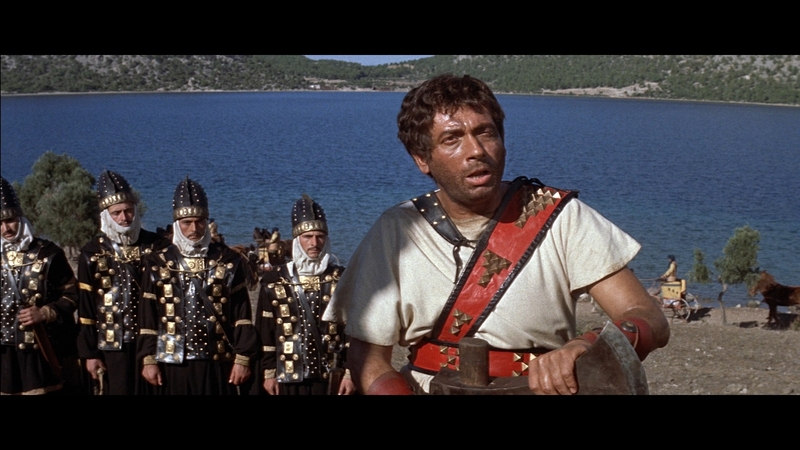 Some of the action comes off as dated and phony, lacking the scale of its better peers such as Ben-Hur. 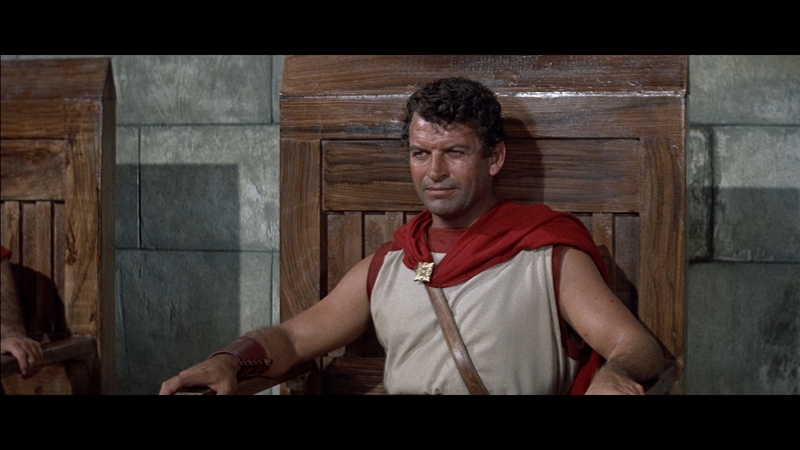 The 300 Spartans is a fine historical film, carried by Richard Egan’s deft handling of Leonidas’ heroism. His performance is a pitch-perfect benchmark for the warrior-leader archetype that later stars such as Russell Crowe in Gladiator and Gerard Butler in 300 would emulate. 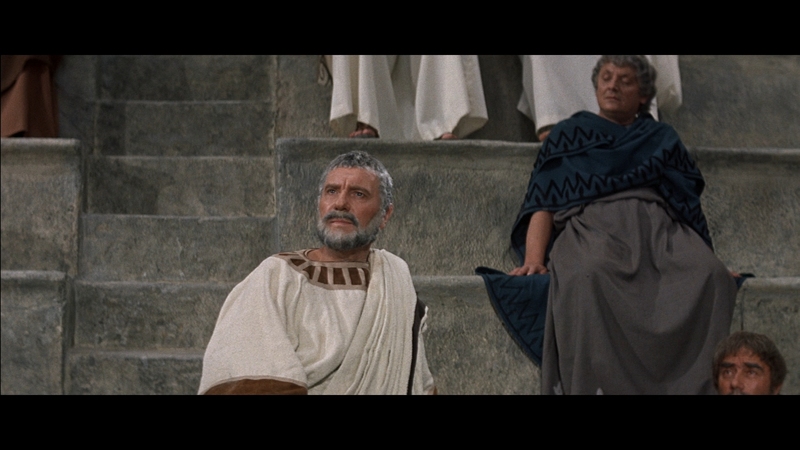 Twentieth-Century Fox has released a number of CinemaScope films on Blu-ray. Without equivocation this is one of their most film-like CinemaScope transfers to date, possibly their finest work yet in faithfully preserving the original cinematography in pristine clarity. 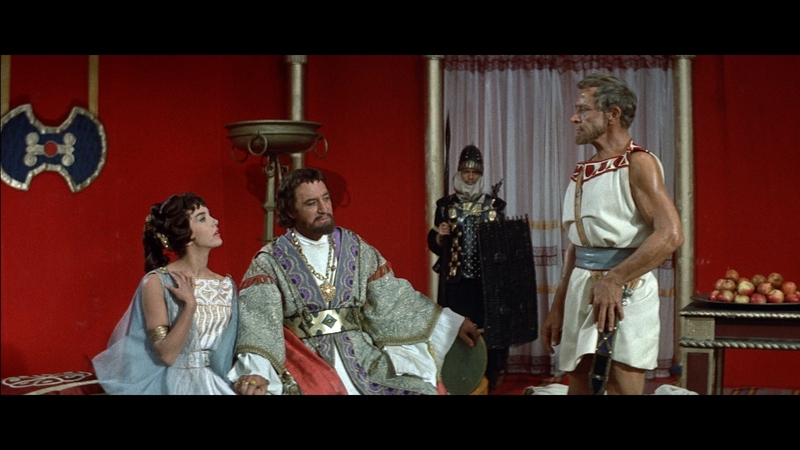 This is a gorgeous film transfer presented in its proper 2.35:1 aspect ratio at 1080P resolution. Watch the brilliant Deluxe color saturation as the red war cloaks of the Spartans march to battle against Xerxes’ supposedly unstoppable armies. The 300 Spartans runs on the short side for a sword-and-sandal action movie, only 113 minutes. Fox has bestowed it with a reference video encode that is completely flawless and free of artifacts, clocking in at an average video bitrate of 37.97 Mbps. That is the highest figure modern encoders will allow for Blu-ray video. The high parameters are needed for the exquisite level of unfiltered high-frequency content found in the transfer. Lensed by legendary cinematographer Geoffrey Unsworth, the transfer replicates the natural grain structure with uncanny accuracy. Film purists have to check out this Blu-ray’s video quality. The natural sharpness and perfect contrast are backed with crisp black levels. The film scan is obviously a new one and taken from the original camera negative, the leap in detail and color rendition over DVD is stunning. The CinemaScope transfer reproduces every nuance found on the well-preserved film elements, leaving a Hi-Def presentation that looks as vital today as it must have upon theatrical release. This is an unqualified winner for the Blu-ray format and videophiles everywhere. It shouldn’t be missed for lovers of classic film reproduction. Fox includes the original mono soundtrack in an acceptable 1.0 DTS-HD MA option. The monaural audio provides fine clarity and fidelity for the dialogue-laden scenes. It does become overly harsh and grating when the musical score swells in the course of battle. The mix sounds hot and over compressed when things get busy, forcing most I suspect to turn the volume down. The DVD included a stereo mix that is not found on this Blu-ray. A 1.0 Dolby Digital dub in Spanish and a 1.0 DTS-HD MA dub in German are included. Optional English SDH, French, Spanish, and German subs display in a white font, which remain inside the 2.35:1 aspect ratio at all times. Either a commentary or some included featurettes would have provided a better historical perspective for The 300 Spartans’ take on history. Theatrical Trailer (02:37 in SD) – A vintage trailer that focuses on the battles.